Kenya offers visitors a wonderful diversity of landscapes, rich wildlife and fascinating traditional cultures and warrior tribes. 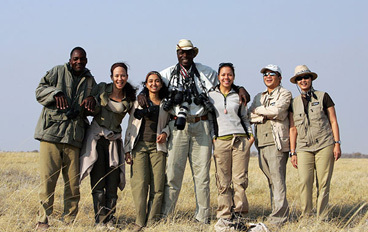 Whether it be the greatest game show on earth, when the annual wildebeest migration pours into the fertile grasses of the Maasai Mara, or the world's greatest ornithological spectacle of millions of flamingoes on shimmering Lake Nakuru, or the unique endemic mammal species only found in its national parks and reserves in the north, Kenya's flora and fauna is captivating to even the most seasoned traveller. The Kenyan landscape is among the most dramatic and scenically diverse on the planet, containing almost every known land form, from true glacial ice to arid desert, mountain massifs to sprawling savannahs, and from large lakes to dense forests. The Great Rift Valley, its floor littered with beautiful lakes and extinct volcanoes, cuts through this land from north to south. Mount Kenya, at 17,058 feet (5,199 metres), with its dramatic snow-capped peaks, stands sentinel above rolling grassland plains and the intriguing semi-desert wilderness much further to the north. Lake Victoria, the largest lake in Africa and source of the Nile, dominates the southwest of the country, and Lake Turkana with its rich paleontological history and haunting landscapes borders the north. In Kenya, we concentrate our safaris in the game-rich Maasai Mara National Reserve, Amboseli National Park and around the Chyulu Hills and Tsavo in the south, along the Great Rift Valley lakes, in particular Naivasha, Nakuru and Bogoria, into Meru, Samburu and Shaba national parks in the arid lowlands of northwestern Kenya and, lastly, on the Laikipia Plateau bordering the rugged Northern Frontier district. There are currently 40 different ethnic groups in Kenya. From the Maasai herdsmen and their sacred cattle found mainly in southern Kenya, to the Kikuyu farmers who make their home in the foothills of Mount Kenya, to the semi-nomadic Samburu pastoralists living above the equator where Mount Kenya merges into the northern desert - Kenya offers an unmatched cultural experience. More than 1,000 different languages are spoken in Africa! Swahili is a combination of African tribal languages, Arabic and Portuguese. Somalia is the only country in the world where all the citizens speak one language, Somali. The Berbers of North Africa have no written form of their language. Cosseted in the most luxurious lodges and guided by extraordinary Kenyan guides, this safari ventures into the "Volcano Hills" of Chyulu and the grasslands of the Masai Mara, home to Africa's greatest mammal migration. A Big Five safari combined with the great wildebeest migration that rumbles across the Masai Mara's never ending plains, luxuriously accommodated in two of Kenya's most iconic wildlife viewing areas. Enjoy Kenya's contrasting landscapes and its extraordinary wildlife. Rejuvenate at luxury tented camps on the Laikipia plateau, in the shadow of Mount Kenya and in the Masai Mara, arguably Africa's richest wildlife reserve.